One of the most delightful writers of the late 1800s and early 1900s was a man named Frederick Boyle. Frederick Boyle was an unusual writer on orchids. He wrote from a very human perspective and the people in his stories were often more interesting than the orchids themselves. Boyle traveled extensively to the remote jungle areas where orchids grew wild in Asia and the Americas and he glamorized the orchids found there with tales of intrigue, deceit, love, mayhem and murder. He wrote some fascinating tales about the sexual habits of the Indian tribes. Boyle apparently captivated Mary Nobel McQuerry and she once told me her all-time favorite orchid book was Boyles’ The Woodlands Orchids. The Woodlands was the name given by an Englishman, Robert Measures, to his estate in Streatham, England. Measures had suffered a nervous breakdown from handling his extensive business interests and his doctor prescribed a house in the country and a relaxing hobby like gardening to cure the affliction. The plants he grew had to be challenging and something “you can make a study of,” the doctor told him. Orchids met all the requirements, and in typical Measure’s fashion, he developed one of the finest orchid collections in the world. He was so proud of his collection in fact, that he could not resist telling everyone about it, and he commissioned Frederick Boyle to write a book on it with the history of his favorite orchid plants. The book, The Woodlands Orchids, was published in 1901 and McQuerry, of course, had a copy signed by Robert Measures himself. Boyles biggest legacy, however, was not The Woodlands Orchids, but a book he had written a few years earlier in 1893 entitled About Orchids – A Chat in which he created a grand myth about the discovery of Cattleya labiata. Boyle’s myth has been told and retold by orchid experts, both botanical and horticultural, as though it were fact for over 100 years. It is still presented occasionally even today as the truth about the discovery of C. labiata even though it is factually untrue in all respects. We know today, of course, that Cattleya labiata is native to the Brazilian state of Pernambuco and it never existed in the state of Rio de Janeiro. It was first discovered in Pernambuco by William Swainson in 1817 and Swainson shipped the plants not to William Cattley but to the Glasgow Botanic Garden in Scotland. At the request of Swainson, Glasgow sent a few of the plants to William Cattley and Cattley took such good care of them that they flowered a full year ahead of the plants Glasgow kept for themselves. Boyle can be forgiven for creating his charming myth because in 1893 no one actually knew where Swainson had discovered the plants. It was not until 1900 that Swainson’s “Sketch of a Journey through Brazil in 1817-1818,” which appeared in the Edinburgh Philosophical Journal of 1819 (vol 1 Pgs 369-373), came to light and solved the problem. 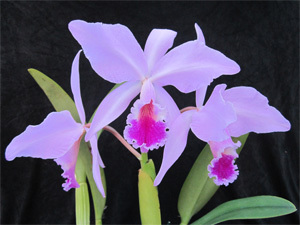 Dispelling Boyle’s myth, of course, takes a lot of the romance out of the discovery of Cattleya labiata. The plant was simply found in a routine collecting trip through Pernambuco by a wandering English naturalist and shipped back to his customer, the Glasgow Botanic Garden, from Recife, the nearest Brazilian seaport. If Swainson had never written a letter to Professor Jameson about his trip to Brazil which was published in the Edinburgh Philosophical Journal, Boyle’s myth would be gospel today. The discovery of Cattleya labiata still makes a good story, of course, because no C. labiata plants were found for over 70 years after Swainson’s original shipment because everyone was looking for them in the wrong place – Rio de Janeiro instead of Pernambuco. The story of Cattleya labiata, like a lot of other orchids, can always be embellished with a little fantasy if it encourages people to start growing the plants. Frederick Boyle was a master at this, and in the case of C. labiata he became perhaps the most infamous maker of orchid myths of all time.